Are you looking for something special for that person in your life who loves the outdoors and hiking? 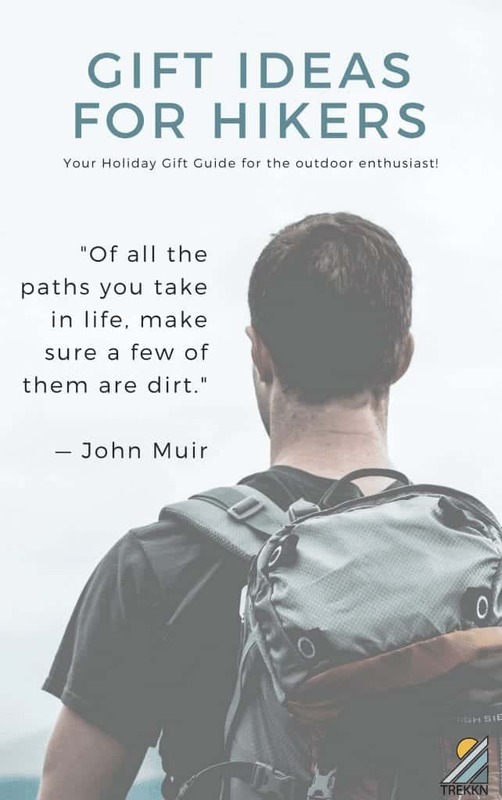 If so, then you’ll enjoy our 2018 Holiday Gift Guide featuring gifts for hikers. We’ve broken it down by price and for him/her for easy shopping and browsing. I don’t know about the guys in your life, but the guys in mine like to get outdoors and hike a trail as much as possible. I’m not sure how many trails they’ve hiked over the last 17 months we’ve been on the road, but some of their favorite trails have been Grinnell Glacier in Glacier National Park, a hiking trail in Banff, Canada that leads to a tea house and exploring the waterfalls in Oregon in the Umpqua National Forest. 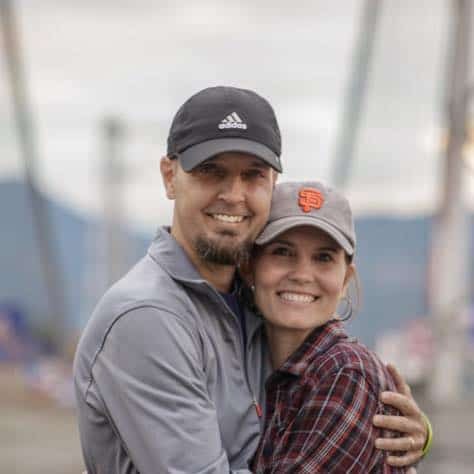 They’ve day hiked every kind of trail you can imagine and I know they’d love some of these hiking gifts for him. These books are fantastic for the person who wants to go exploring and hiking more either in their own city or one they’re visiting. There are quite a few city options such as Denver & Boulder, Washington D.C. & Outlying Areas of Maryland/Virginia, and Portland, just to name a few. These books give the outdoor adventurers a little of everything there is to enjoy around a particular city and include photos, maps, trail rankings and useful backpacking information. It’s fun to look back on your journeys and a hiking adventure is no different. This hiking journal is formatted with prompts including Date, Location, Trails, Weather, Wildlife sightings, and more. This is the perfect way to keep track of one’s hiking memories. Bugs on the trail are no joke, especially if you plan on camping out and doing some backpacking. This insect repellant is effective against ticks, chiggers, mites and mosquitoes; as effective as 100 percent DEET. It will not stain your clothes and lasts up to 6 weeks or 6 washings. Sometimes when you’re on a trail, pain can come out of nowhere. And there’s nothing worse (other than maybe breaking a bone or spraining your ankle) than having back and joint pain as you’re 8 miles into a 15-mile hike. Salonpas products work well and are easy to slip into your pack, not taking up much room. This gift is perfect for a stocking stuffer. Talk about an ingenious invention! LifeStraw removes bacteria & parasites: The microfiltration membrane removes 99.999999% of waterborne bacteria (including E. coli and salmonella), and 99.999% of waterborne parasites (including giardia and cryptosporidium). Dirty water enters one end and clean water exits out the other end. You can have clean drinking water anywhere, which is quite handy for hikers. You never know when something might rip or break while on the trail, which makes a roll of T-Rex tape a necessity. This tape sticks to rough, dirty surfaces in all kinds of weather to get the job done. So whether your trekking poles snap or your tent rips, it can handle the job. We also recommend this as a must-have item for RVers. When you’re on an extended hike or a camping trip, a dead battery on your phone or GPS unit is just plain frustrating. This unit is weatherproof, easy to use and install and with just a few hours of sunlight, will stay powered day and night. My boys swear by Hydro Flask bottles and don’t like to bring any other kind on our hikes. I prefer ones a little lighter in weight, but they like these because they keep their water cold all day long. They’re also incredibly durable. One of ours took a tumble from a mountain and survived. This Hydro Flask design includes a Wide Mouth Straw Lid and a finger loop, you can clip to your pack. They also have a wide range of color choices. With this Leatherman multi-tool, a hiker will be well prepared. It features 14 tools, including a knife, pliers, screwdrivers, wire cutters, a wire stripper, scissors, a package opener, bottle and can openers, a file, and a ruler. With its compact size, lightweight design, and removable pocket clip, it’s easy to slip in your pack or clip onto your pants. What’s better than a cup of hot coffee while on a break from the trail or once you hit the summit? Not much! This espresso machine is small, lightweight and features an innovative handheld design that makes one strong and delicious espresso. This is one of the most popular daypacks and for good reason. The 22L of capacity is perfect for day hikes, has an incredibly stable carry system, and features a Stow-on-the-Go trekking pole attachment system that is designed to quickly attach and carry trekking poles while wearing a pack. The pack comes in several different colors. See more recommendations for best hiking daypacks here. Give the gift of the perfect base layer for cold weather hiking. This shirt will keep you dry, is naturally smell free and looks good worn alone. Be sure to follow the washing instructions so this garment will last for years to come. Do you know a hiker who enjoys photography on the trail? Set them up with this lightweight tripod so they can keep their set up simple. The compact size allows it to fit easily inside small and medium-sized bags, plus since it weighs only 2 pounds, it’s lightweight enough for any length hike. Thanks to the encouragement and gentle nudges of Todd and my boys, I’ve learned to really appreciate hiking and what it has to offer. It’s now my favorite way to exercise, unplug and truly experience the beauty this world has to offer. When I first started hiking, I was very ill-prepared. I didn’t have the right shoes, the right clothes or even the right mindset. But, practice makes perfect and now I know what I need to bring and wear to have the absolute best hiking experience. Whether there’s a lady in your life who’s already a pro at hiking or she’s a beginner and wanting to get out and explore more, you’ll find some fantastic hiking gifts for her on our list. Do socks make a difference on the trail? You better believe it. I found this out the hard way. If comfort on the trail is something you enjoy (and you should) a good pair of socks is crucial. Darn Tough hiking socks are some of the best and they offer styles to wear with hiking boots, 1/4 cushion sock, no show, and crew styles. These socks feature performance fit, which means no slipping, no bunching and no blisters. Which also means fun times on the trail. It doesn’t get much cooler than a 5-in-1 survival tool you can wear on your wrist. K2-peak is a complete paracord survival bracelet that includes: High-Quality Compass. Flint Fire Starter. Fire Scrapper, use it also as Emergency Knife. Emergency Whistle creates noise levels of up to 100db. They offer 4 fixed sizes and 1 adjustable, so you can find one that fits any size wrist. When the temps are low and the wind is whipping around, having your neck covered with a Skida Neckwarmer can make a huge difference in comfort level. These are made in Vermont, feature Wicks Moisture to keep you dry and come in quite a few patterns. Why bother with trekking poles? Because they help save labor efficiently and make your trip more enjoyable. These poles come with three different tips for different terrains, straps, a carry bag, and instructions. These are very durable and lightweight, so they won’t weigh you down. Give the gift of outdoor gear delivered every month for as low as $27.45 a month! Each month a new box featuring up to 6 carefully curated products which inspire you to get outdoors is delivered to your door. Each box has up to $50 of retail value and is all full-sized items. This is a gift they’ll look forward to month after month after month. Order a subscription as a gift here. If you like being able to adjust the hem of your hiking pants, then these are for you. With the drawstring hem, they can go from pants to capris to long shorts in a matter of minutes. These are perfect for when you start a trail and it’s a little chilly, but you quickly start to warm up. Wear them easily over leggings for added warmth. These also make great pants for traveling and other sports activities. They come in six different colors. With an Amazon gift card, hikers can stock up on trail snacks or get that piece of gear she’s been wanting. This pack does well whether you’re hiking a 14er or on a trip to the farmer’s market. You can easily access the main compartment with its large zippered panel, as well as your water bottle from one of the two side mesh pockets. It has a very comfortable back panel with plenty of ventilation for when you’re working hard on the trail. It comes in over ten different colors. Merino Wool is a great choice for a base layer when cold weather hiking or worn alone for cooler days. 100% Merino wool interlock knit provides ultimate comfort and the flatlock seam construction is designed to eliminate chafing. It comes in nine different colors. 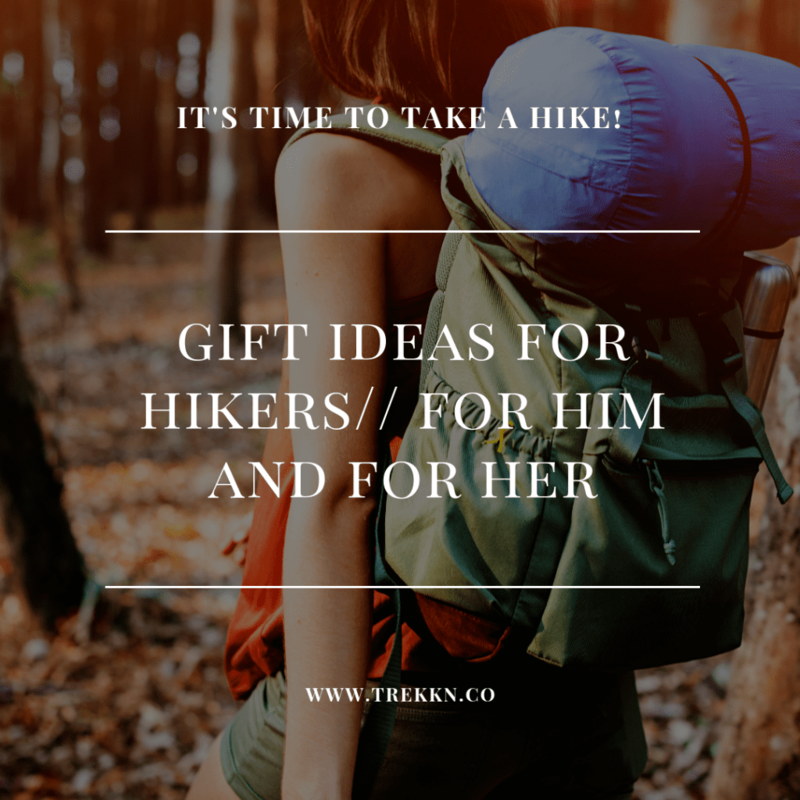 We hope you’ve enjoyed our Holiday Gift Guide for the hiker in your life and that these ideas help you surprise them with an unexpected gift!